With years of experience, knowledge, and insight into how furniture construction methods have changed over time, The Chairmaker and Friends is the place to go for a quality repair or original style restoration, done right the first time. This antique rocker required a new rocker rail, to match the old, and re-enforcement of the corner blocks for strength and stability. Closeup of the new corner blocks, and rocker rail below. In the end, the rocker maintained its classic style. It was repaired for functionality and updated with a clean fabric. The delicate parquetry top of this table required special care when refinishing the veneer. The inlaid top was carefully removed of all scratches and simply covered with a protective matte topcoat, while the table base was painted. Repairs were needed on the leg of this chair for structural support, before it was refinished and reupholstered. 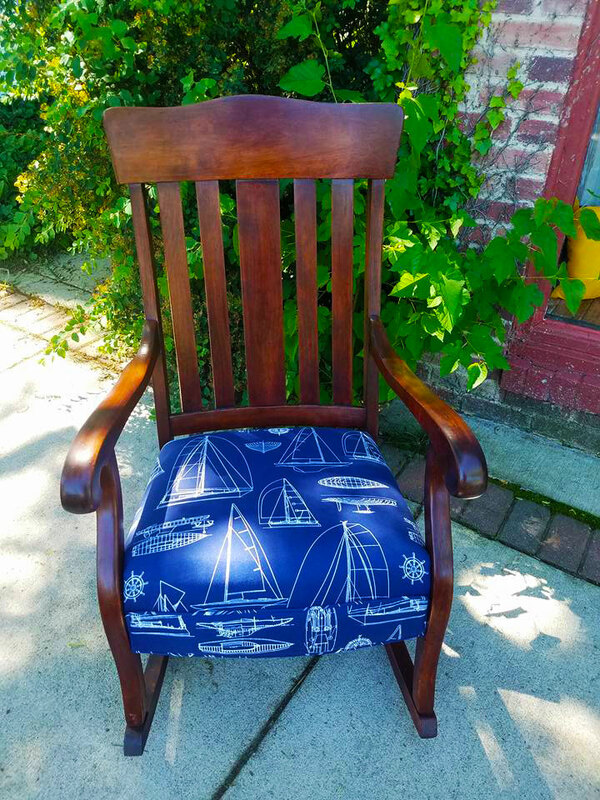 After all repairs were made, and the interior of the cushion and springs replaced, this sleek Captain-style chair was recovered in a favorite fabric and guaranteed for life. Check out our blog to see the whole process of the nautical chairs! One chair of a set of four, these chairs required a lot of cleanup and preparation before being reupholstered. The lawn-style strips of plastic were removed, along with hundreds of tiny, old nails, from the frame. The wooden frame was then sanded, cleaned, and stained. A new pattern was created to incorporate a soft fabric, rather than the old vinyl webbing strips.